I know that Mondays are typically reserved for man crushes. But, I would like to change that up a bit and start sharing my shoe designer crushes. This Monday I am kicking it off with Paul Andrew. There are many reasons why I love me some him. First and foremost, my first ever purchase of a blue shoes was one of his designs and I hate blue (at least I thought I did). Take a look at an illustration of the blue python Europeaus below and you will understand why I had to have them. If these shoes are not enough to convince you, here are a few more reasons you should love Paul Andrew too. Andrew launched his line in the Spring of 2013 after designing shoes for the likes of Donna Karan, Calvin Klein, Alexander McQueen and Narcisco Rodriquez. Last year he joined the ranks of the likes of Public School, Joseph Altuzarra and Alexander Wang with his win of the CFDA/Vogue Fashion award. 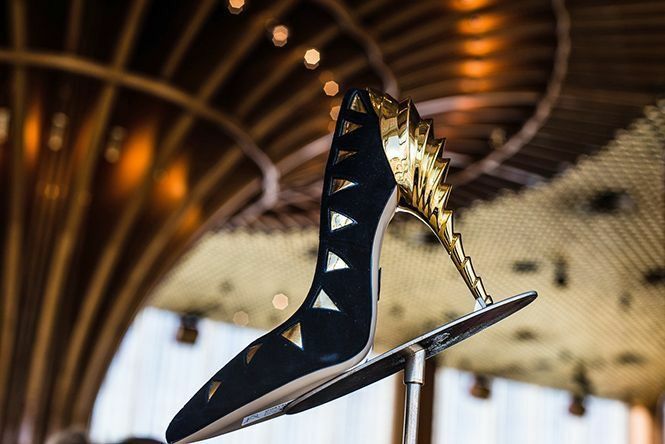 He was the first shoe designer ever to win this coveted award. The CFDA award includes $300,0000 in prize money which Andrew said would be used to fund expansion and he is keeping his word. He has already launched pop-up shops in Donna Karan stores in London and New York. He also has a planned collaboration with JCrew that will be hitting stores in June of this year. As if that wasn’t enough – his Fall 2015 Presentation during NYFW was killer! His collection was an ode to the city that never sleeps with over the knee boots with the NYC skyline imprinted on them and shoes with heels that remind you of NYC skyscrapers. Are you crushing on Paul Andrew yet? If not, hit yourself over the head because you should be. This entry was posted in Designer, shoes, Shopping and tagged Designer, Monday Crush, NYFW, Paul Andrew, Shoes by ShoeMiracle. Bookmark the permalink.